I hope this post finds you all well and hopefully you have had much better weather than we are here in Northern Ireland. I swear this summer has seen us go through the hottest days in decades now we have had a whole seasons worth of rain in a matter of days. Ok so that might be a slight exaggeration about the rain but it feels like it. So back to the point of the post. I wanted to share with you all my favourite products from July and August. I am always trying new products and changing things up, but every month there will always be those products that just stick in the rotation continually. Kaeso Luxe Facial Serum: I started using this product earlier in the year, having been a fan of the brand for a long time, and this soon became a much loved product of mine. I use this at night after taking off my make up and cleansing my skin, leaving it to sink in and do its magic during the night. It claims to brighten and renew the skin as well as moisturising and making silky soft. I always feel that with this brand my skin feels so much more youthful and definitely looks brighter. Kaeso I Sparkle: I love this product. I keep it in the fridge and love using it in the morning to calm any puffiness around my eyes. It claims to help the eyes by decongesting the area to give them a toned and more uplifted look. I would not be without this product in my arsenal of products. I also massage the gel in to my lashes as the rapeseed oil is good for keeping your lashes in good condition between lash lifting treatments. Mitchum Roll On. I have been using Mitchum for a long long time and I would not be without it through out the year as it is, but when it comes to summer there is a feeling of security and safety in knowing you are wearing Mitchum and unlike so many roll on deoderants it does not make my skin itch like a bear with a million fleas building an army! 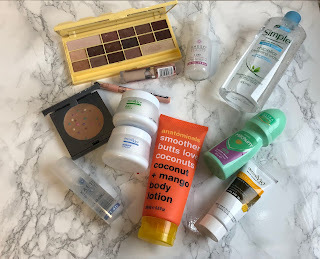 Simple Micellar Water: I have always been a fan of the Simple skincare brand and have tried so many of their products. When I used to be a naughty girl and use face wipes every day Simple was always my go to. Now that I am more conscious of my skin though I have moved on to other cleansers etc. This cleansing water is very gentle and hard working. I never have to scrub around my eyes to remove my mascara. Which I love because my eyes are that sensitive that some leave me looking like I have been crying for 3 days. Anatomicals Body Butter: Ok where do I start I am obsessed with this. Anatomicals sent me some products to try out and this fast became a daily use product for me. During May, June and a few hours in July we had stunning weather. I even managed to turn a more alive looking shade of pale. With that sun exposure of course I need something to add the moisture back in to my skin, so this mango and coconut body lotion was perfect. It was thick and intensely moisturising. It really doesnt take much, believe me I made the mistake on my first use of putting loads on, it was so slippery I nearly fell out of bed. So I learned very fast that a little goes a long way. My skin feels and smells gorgeous with this on. I am definitely repurchasing this product! Derma V10 Hand and Nail Cream: As a Beautician that specialises in nail treatments my hands take a real battering on a daily basis, and so I am always looking for great hand creams that will nourish my very dry sad hands. This one I picked up in a local pound shop, for well yes you guessed it £1. It is lovely and nicely moisturising, it is a great wee handbag option for when you are out and about and have used those terrible drying soaps in public restrooms. Derma V10 Day and Night Cream: Again another fab find, this time not in the pound shop but in my local Gordons Chemist. I always like to try new night and day creams together. This one is gorgeous, the night cream is thick and really hydrating and nourishing and the day cream is lighter and absorbs lovely in to the skin for putting my makeup on over the top. I love finding wee bargain gems like this brand. I used these for most of the summer before trying another brand out. Magic Minerals Foundation: This is a return favourite of mine. I used it last summer too. I love a product like this that doesnt take much work and I dont have to worry about it sweating off my skin during the hotter weather. Lets face it I am a mess I lose a gallon of water a day through my beautiful glistening beads of perspiration lol. So a product like this really helps because it mattifies my skin and gives me a light coverage without being too heavy. It doesnt cover all my flaws and imperfections, but I am not worried about that for the summer. I just want a lighter more subtle look, so this is great. It is £10-15 depending where you purchase it so it is inexpensive too. I lvoe it for travelling as well. Doesnt take up much space and its not another dreaded liquid we have to decant in to a smaller bottle for the plane journey. I loved it last year on holiday for the evenings to tone down the redness in my skin from baking in the hot sun all day in spain. Irish skin goes a pretty shade of lobster red no matter how much sun cream you use. Makeup Revolution: White Chocolate Eyeshadow Palette: This palette has been a long favourite of mine since I purchased it, and even though It didn't see much use over the summer, any time I did use makeup this was the palette that I used. Makeup Revolution Conceal and Define: This concealer is a cult favourite in the online blogging community and also massively loved in Lyndseys world too. I have tried so many concealers and this one has just blown me away with its coverage and longevity. I love that they have also brought out a bigger size in this as well. Still an awesome price too. Maybelline Eyebrow Pencil: This has been my go to all summer, I have so many pencils in my arsenal but this one for some reason it has stuck with me. My only thing with the shape of it is how are you meant to keep it sharp? If you know please enlighten me, because I must be missing something. So there you have it, that is my loves for the last season. Now I am excited to be moving on to Autum/fall shades and products. I am looking forward to spicy lip colours and warmer tones for this season. What is your favourite products for this time of the year? Thank you for reading, don't forget to subscribe to be kept up to date with my upcoming posts.